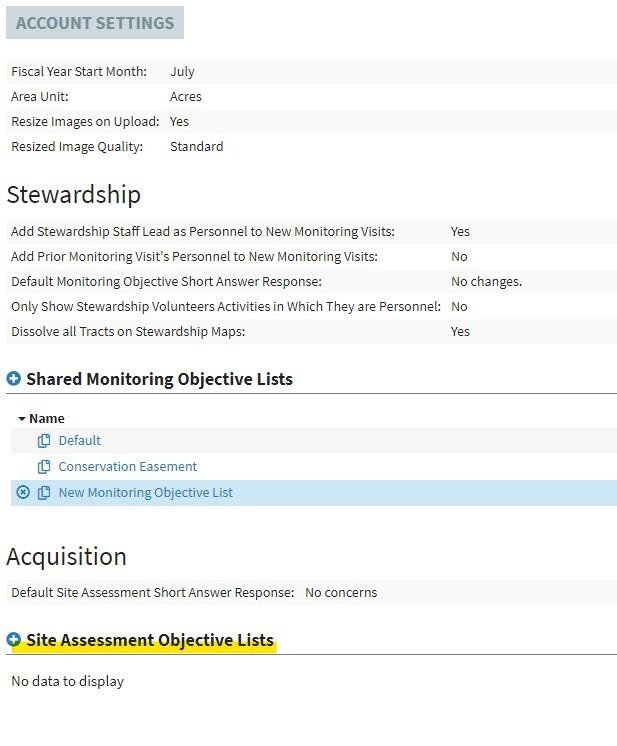 Acquisition Site Assessments are a lot like Monitoring Visits on the Stewardship side of things. 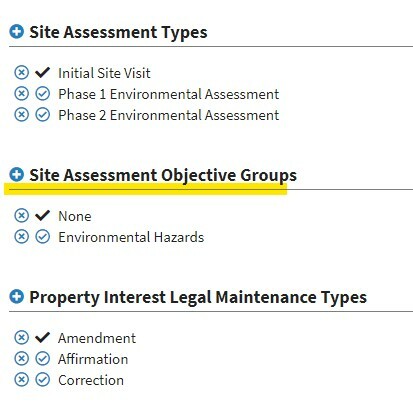 Typically organizations will have a checklist of things they look for during their initial site visits or environmental hazards reviews. Until now, there was no way to capture that data in LANDSCAPE, however. If you need to add objectives that aren't included in the saved list, you can by clicking the plus button at the top of the list. If you need to tweak the objectives that are there, you can click the "Show Definitions" link to switch from the data entry view into the definitions view. From there you can change the objective properties. 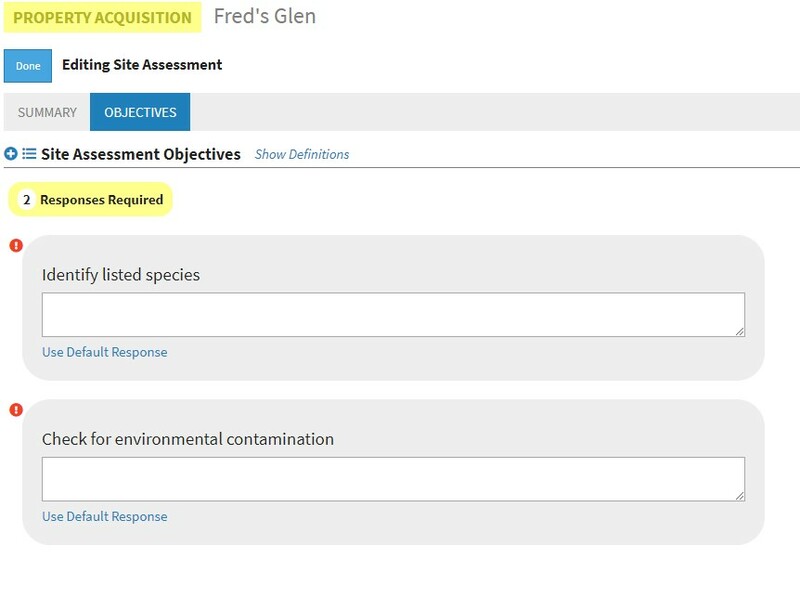 If you use the LANDSCAPE Mobile app to collect Site Assessment data, the latest version will allow you to collect the objectives' data as well. 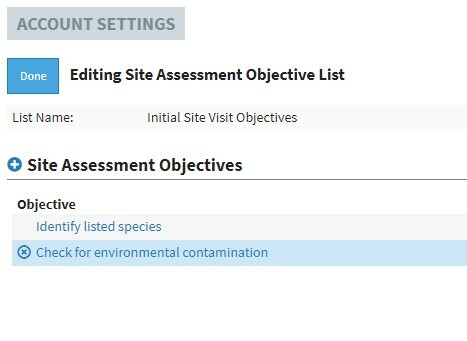 You can now query and report on Site Assessments directly as well. 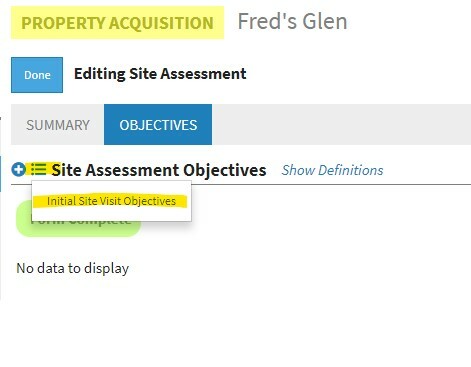 This allows you to create report templates specifically for Site Assessments. So, just like Monitoring Visits, you have direct access to the photos and map data of the Site Assessment without going through the Property Acquisition first. You still have access to all the Property Acquisition data in your templates though. Modern web browsers have the ability to "print" their contents to a PDF file instead of paper. Since the launch of LANDSCAPE, this is the feature that the software has relied on to create digital documents directly from the reports that you generate. There are some issues with this approach though. First, each browser has a different look and feel to its print window. Some offer options for controlling margins and other layout features. Some handle the printing of "background" graphics (such as those used in maps). Some allow you to add just page numbers, while others require you to take all the header and footer information they give you. All of these variables often mean that you are forced to fiddle around in the print window to get the output you want. Further, if you wanted to generate a single PDF for each result in a query you were out of luck. When you press the button you will have the option to create a single PDF for all your query results, or separate PDFs for each. Additionally, if you are using a Monitoring Visits template, you'll have the additional option of automatically attaching the generated PDF to the Documents section of the Monitoring Visit. The PDF creation takes a bit of time, so the software will email you with a link to download your files when they are ready. You'll notice that page numbers are automatic. There isn't currently a way to turn them off or change their style. If enough of you need this feature, we can add it to the to-do list. I hope you find this new feature a time-saver. When you are managing a collection of properties that were acquired at different times as a single preserve, it makes a lot of sense to add all the Tracts into a single Stewardship activity. Doing so is nice because you now have all the Tracts' boundaries on the same map. Sometimes, however, especially if there are a lot of Tracts, the interior boundaries of all the Tracts can be distracting. All the interior boundaries have been removed leaving a nice, clean outer boundary. This dissolve operation is only visual. All the original Tract boundaries are still fully intact and you'll see them in other maps within LANDSCAPE.